Living in Santa Fe the hot springs in the area are of great interest. There are a bunch of great hot springs spas in the area, that I highly recommend spending a day at. These spas cost money and that can sometimes be a factor for whether or not we can spend a day to treat ourselves. To solve this problem, I decided to drive up to the Spence Hot Springs in Jemez Springs, New Mexico. Not only is the drive through Los Alamos and past White Rock just beautifully breathtaking, but you have many chances to pull off the road while driving up the mountains in the national reserve to site see. When you finally get to the pull off, it’s a little hike along a peaceful creek and slightly up a hill. In the fall, the trees are beautiful with the autumn colors. I was taken aback by the the peaceful quietness of the area. The soft running water, feeling the slight breeze, an hearing the wind in the leaves. Looking up, I could see the layers of mountains, with the different colors of the season, reds, yellows and greens. Far behind, the back layers of the mountains gradually getting a darker shade of blue. The water in the hot springs isn’t too hot or too cold, rather it’s the perfect temperature. As it is a natural springs, you have to be careful of the rocks that are covered in moss. Once you find a comfortable spot to sit, enjoy the view, be in the moment, and feel. There’s no place like it, it is truly a blessing that we can experience this living in New Mexico. While I was there, a local couple and a few ladies came up. Since I am new to the area, I got the opportunity to ask about other beautiful places to visit while I’m here. Another perk to living in New Mexico is that everybody is super friendly and always willing to help or give suggestions for where to go and things to check out. 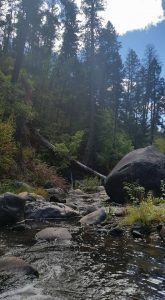 If you’re looking for a little self-care or just wanting to get out and enjoy some beautiful New Mexico scenery, Spence hot springs is a short, scenic hour and a half, drive to a beautiful relaxation spot. Cassie Moran is a first year student at Southwestern College studying Counseling and Art Therapy.